In an exclusive interview with Karen News, General Baw Kyaw Heh, the Vice Chief of Staff of the Karen National Liberation Army (KNLA) and is its second highest commander explained his concerns about the current peace building process with the government and why he thinks the recent ceasefire focus is now on business and not on peace. Gen Baw Kyaw Heh, a former Karen Special Forces officer is highly regarded by his soldiers as a tough but disciplined military commander. 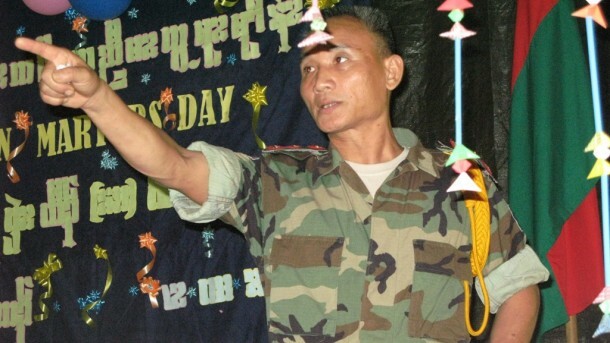 Gen Baw Kyaw Heh is the former head of the KNLA’s Brigade 5 and is renown within the Karen community as a ‘cleanskin’ – someone without the baggage of having conflicting business interests. Karen villagers in Mutraw District spoke highly to Karen News of General Baw Kyaw Heh’s commitment to their security and wellbeing. General Baw Kyaw Heh’s denied to Karen News that his position on the ceasefire with the government is too harsh. Gen Baw Kyaw Heh points out that the KNU and the government, despite the two years since the signing of the ceasefire, that it is still only at the preliminary stage. Gen Baw Kyaw Heh hit back at his critics within the KNU who claim his tough stance is destabilizing. Gen Baw Kyaw Heh stresses that now is not the time for businesses or developers to be pushing their investments in Karen State. Gen Baw Kyaw Heh said the international community in its haste to accept the ‘new’ Burma it did not take the time to properly understand the ceasefire conditions. Gen Baw Kyaw Heh points out that the government has benefitted by the ceasefire talks by reinforcing its military presence in Karen State. Gen Baw Kyaw Heh said that the KNU has to be ultra vigilant at this time as he fears the government will use any excuse to accuse the Karen of breaking the ceasefire. Gen Baw Kyaw Heh told Karen News that the government should obey the conditions of the ceasefire agreement and talk to the KNU prior to sending its soldiers into Karen communities.